What's YOUR VISION of home? Needs, desires, interests, personal styles, preferences and avenues of self expression are never quite the same. YOUR VISION is our guide. Share your ideas with us. We'll listen. Share your ideas with us. We'll listen. Our goal is an engaging process of creative discovery that exceeds your expectations - resulting in your own unique expression of home. We create homes that are each as wonderfully unique as our clients. We meet with you at your home and at your convenience to learn about your goals for the project, and its anticipated time-frame. Based on your needs expressed at our meeting, we draft a proposal outlining a detailed project-specific process for acheiving your goals. The process outlined is matched to time estimates required to perform the various tasks. The proposal concludes with an estimated total of hourly services and billing rates. Steps 1 and 2 are free, and with no obligation! Every project unfolds through a collaborative effort, where ideas are shared in a series of meetings. Early meetings focus on identifying and addressing overarching project goals. Later meetings are key to fine-tuning. Often, the builder is present at later meetings, enabling the team to move efficiently through cost estimating to completion. Between meetings the project moves forward through drawing efforts aimed at refining ideas and clarifying information. A very detailed permit and construction drawing set results. Please email pfreet@pafarc.com for a free consultation. Patrick Freet founded PAF Architecture in 2003. He has 23 years of professional architectural experience. While a project architect at BKV Group and ALTUS Architecture in Minneapolis, he worked on a broad range of residential, commercial, and municipal projects. 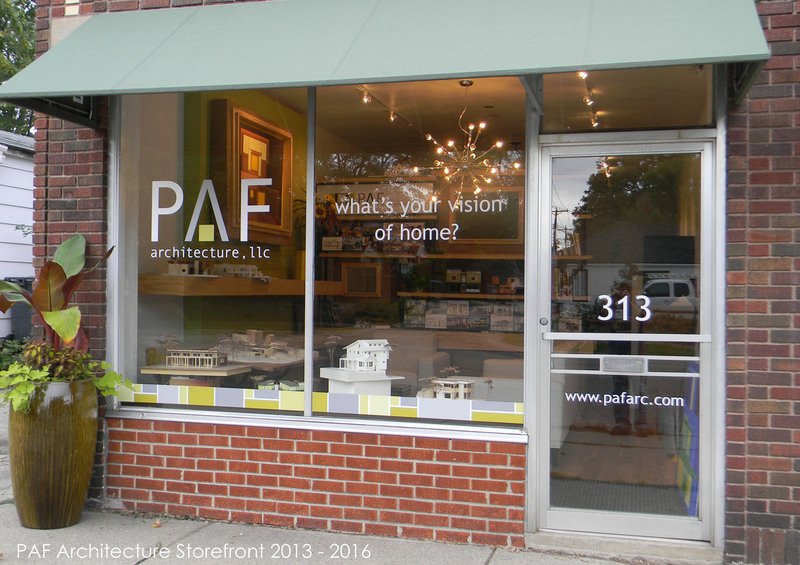 For the past 18 years, Pat has focused his talents on residential architecture. He enjoys working closely with his clients to help them define their own architectural styles. Pat is a licensed architect in the state of Minnesota. Alice Schimunek is a designer and project manager at PAF Architecture. In 2014 Alice won the Design Rochester competition with her housing proposal to develop four properties along the Zumbro River. She is a talented and passionate designer. Alice has a Master of Architecture degree from Kansas State University.